Help! How do I fix this?! 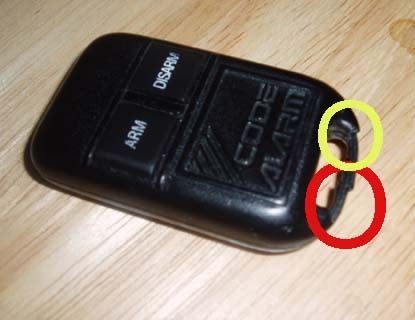 UPDATE: I am told it is hard to see all the parts that is broken on the clicker, so I updated the photo and circled the parts to look carefully at. It’s not just broken in the middle. That entire part of the clicker is broken. It is as if I have nothing to duct tape & nothing to attach the clicker to my keychain with. The jozjozjoz.com archives for Tuesday, July 13th, 2004.